A cervical laminectomy is a spine surgery that involves removing bone to relieve excess pressure on the spinal nerve(s) in the cervical spine, or neck. A cervical laminectomy can be performed to relieve the symptoms of spinal stenosis, the narrowing of the spinal canal. The term laminectomy is derived from the Latin wordslamina (thin plate, sheet or layer), and -ectomy (removal). 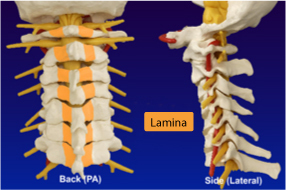 A laminectomy removes or “trims” the lamina (roof) of the vertebrae to create space for the nerves leaving the spine. The goal of a cervical laminectomy is to relieve pressure on the spinal nerves by removing the part of the lamina that is the source of the pressure. To determine whether your condition requires treatment with a cervical laminectomy, your doctor will examine your back and your medical history, and may order an X-ray,computed tomography (CT) scan or magnetic resonance imaging (MRI) scan of your spine. A surgical procedure such as a cervical laminectomy is typically recommended after non-surgical treatment options, such as medication, rest and physical therapy, fail to relieve symptoms after a reasonable length of time.